4 Pics 1 Word White feathers. Downward graph. Downward slope. Feathered pillow. People walking down stairs. Find the 4 pics 1 word answers you need and still have fun with the game that has hooked millions of people. 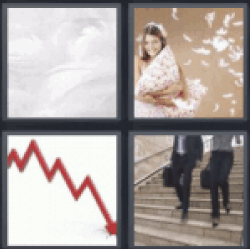 4 pics 1 word white feathers.